Ahmet felt a strange impression to search for a Seventh-day Adventist church while visiting his ill father in a large Middle Eastern city where Adventists are not allowed to witness in public or distribute literature door to door. Ahmet had never met an Adventist or visited an Adventist church before. Following the impression, he set off to find the church in the city of more than 10 million people population. He had no information about the church’s address, and he did not know than only about 30 Adventist members are known to live in the city. Adventist Mission is not identifying the location or Ahmet by his real name to safeguard the Adventist work in the region. Finally, Ahmet found the church, stepped into the entrance area, and knocked on the inner door. He was met with silence. Local church members had placed a bookrack inside the church entrance, an area that is legally not considered a public space and therefore available for witnessing. Noticing the bookrack filled with free literature, Ahmet felt convicted to pick up a title that caught his attention: “The Victory of Love,” an abridged version of “The Great Controversy” by Adventist Church co-founder Ellen White. Returning to his father’s home, Ahmet kept thinking about the book that he had picked up in the church entrance. He wondered whether the Spirit of the Lord had taken him to the Adventist church. He had had no previous contact with any Adventists and knew nothing of their beliefs. When Ahmet finished reading “The Victory of Love” three days later, he concluded that Ellen White’s words were deep and in harmony with the Bible. He found a stamp with contact information on the last page of the book and decided to contact local Adventist leaders. He soon received a copy of Ellen White’s book “Patriarchs and Prophets” from one of the leaders and began to read with intense interest. “I said to myself, ‘I am going to read all her books for all of my life, and I am going to improve my life with her books!’” Ahmet said, excitement shining in his face. He read many other books — “The Great Controversy,” “Acts of the Apostles,” “Thoughts From the Mount of Blessing” — before discovering the one that he loves most. “‘The Desire of Ages’ is my favorite of all her books,” he said. He decided to become an Adventist after he read those books. Today Ahmet wants everyone to know Ellen White. “As an Adventist, I will tell everyone: Ellen White is a prophet of God,” he said with forceful conviction. Even more, Ahmet said he wants to share what her books have taught him more clearly than ever before: the love of God. He plans to reach out to people from his own country who have never heard the gospel. He is engaged in talks with Adventist leaders to find ways of accomplishing this. 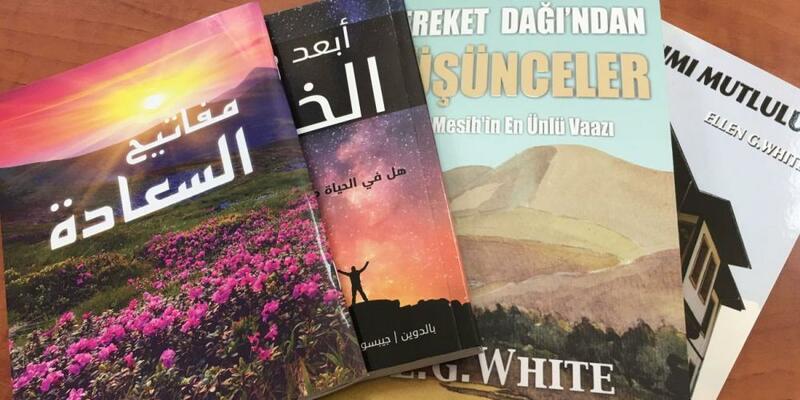 Ahmet’s story has encouraged church leaders to maintain their efforts to share Ellen White’s writings. “We need to do all we can to share the treasure we have so that more can read personally and draw closer to Jesus,” said Rick McEdward, president of the Middle East and North Africa Union. Why an Indian Village Stopped Harassing Adventists Two unusual incidents end five years of religious persecution. Enormous Evangelistic Endeavor Kicks Off in Eastern Europe Ted Wilson hopes the meetings will inspire a spiritual revival across Europe.